Aaaaah the poor old long suffering CBF125. So I've serviced the CB500X and as part of that service I fitted 2 brand new from Honda NGK CPR8EA-9 spark plugs. Upon inspection of the "old" plugs they looked just fine with a dusting of light tan deposits on them even after 16,000 miles. By 'eck thurs nowt wrong wi them, theys gud fer another 50,000 miles lad. I remember when I were a lad spark plugs used to wear out. You'd pull old plugs out of the car or the bike and it would be obvious they were shot. These days they seem to last a whole lot longer. Are today's fuels better? Are today's engines better? Are today's spark plugs better? I honestly don't know, I hope someone reading this can offer some insight. The problem with the plug being exposed to the elements is rust. So now I have 2 NGK CPR8EA-9 plugs in good condition. 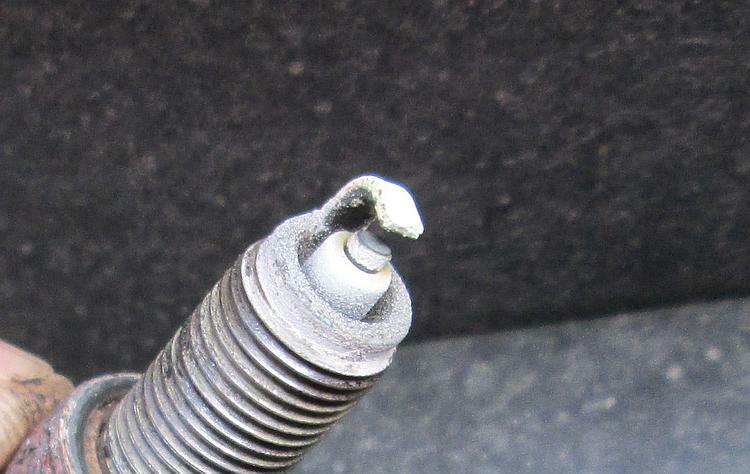 The NGK CPR7EA-9 (note - the "7" and the "8" difference) spark plug in the CBF125 is not giving me any trouble but it has been in there long enough for the exposed metal to have become seriously rusty. The plug is exposed to the elements on the 125 so much it is at risk of crumbling into rust before the business end is kaput. What's the difference between a CPR7EA-9 and a CPR8EA-9? None - that the man on the street can tell. However NGK's own website will tell you. It's the plug's "temperature". 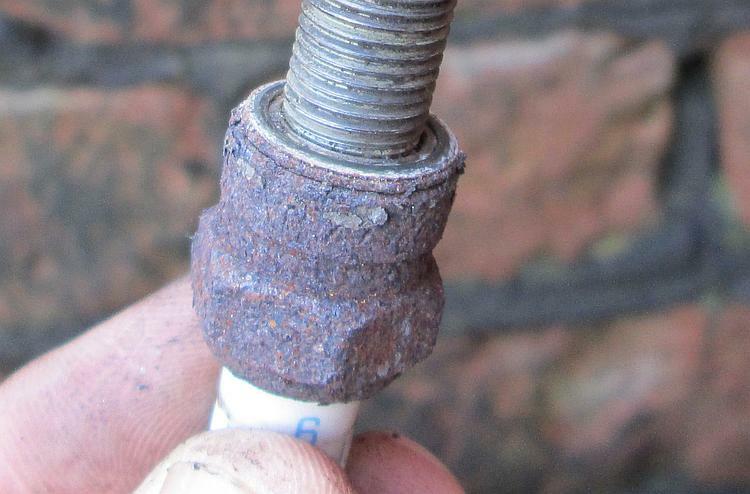 Ideally a spark plug needs to be hot enough so that the muck that burning petrol creates is burned off. In layman's terms if the tip is too cold it would get covered in soot or oil. If it gets too hot the tip might set fire to the petrol and air mix before it's meant to (pre-ignition) and the heat will wear the tip away much quicker. Different engines have different characteristics - some run cool, some run hot. 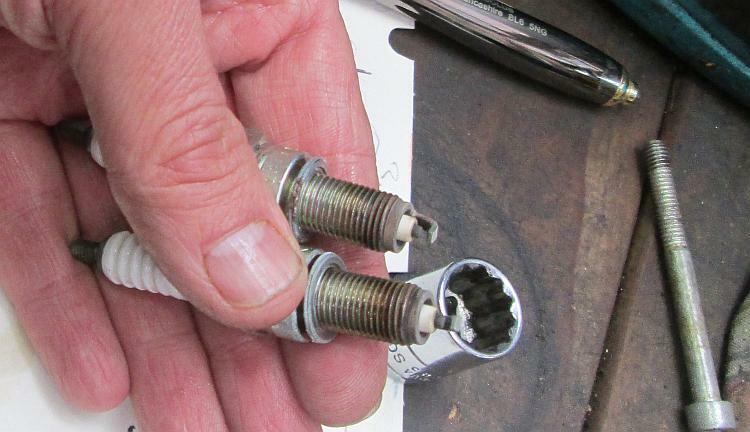 To compensate for this spark plugs can be designed to retain heat or get rid of heat. If your engine runs cold you use a plug that keeps more heat, if your engine runs hot use a plug that dissipates heat well. The Haynes manual for the CBF125 recommends a ...7... spark plug unless there is to be a lot of sustained high speed riding then use a ...8... plug. The ...7... plug is due for replacement, I have 2 ...8... plugs in good order and I do a lot of motorway work on my 125. When I remove the ...7... plug the tip is white. This suggests the tip is running a little hot, probably due to the motorway riding. The ...8... plug is designed to dissipate heat a *little* better than the ...7... plug. Also the ...8...plug is here in my hand. Oh hang on, it's now in the CBF125. The old "7" plug from the 125 suggests it's running a little too hot. So far the ...8... plug is working fine. I'd argue the bike feels a little better with it actually but I suspect that is a) due to it being a newer plug and b) I'm convincing myself it's better - kidology. While I had the plug out I did a compression test with my very very old stick it in the hole compression tester. 145psi. That seems pretty good to me, I'm pleased with that. I wonder what the Haynes manual says it ought to be. 185psi. Ahhh. Damn. Not as good as I thought. I told you the compression tester was old. Somewhere in the past 67,700 miles I seem to have lost 40psi. If I were any kind of proper motorcycle mechanic I should be looking at a rebore, new piston and rings, valve re-cutting and valve lapping. Luckily I'm not. I'm still getting about 140mpg. I'm still able to ride at my usual slow motorways speeds. The bike still starts easily. T'ain't worth the effort, not when I fear something else must give out sooner or later. You never told me what you did with that bit of chain you took. Did you invent something amazing with it. Not a professional, but I'd say for a bike of that age that that sort of compression pressure is fine. 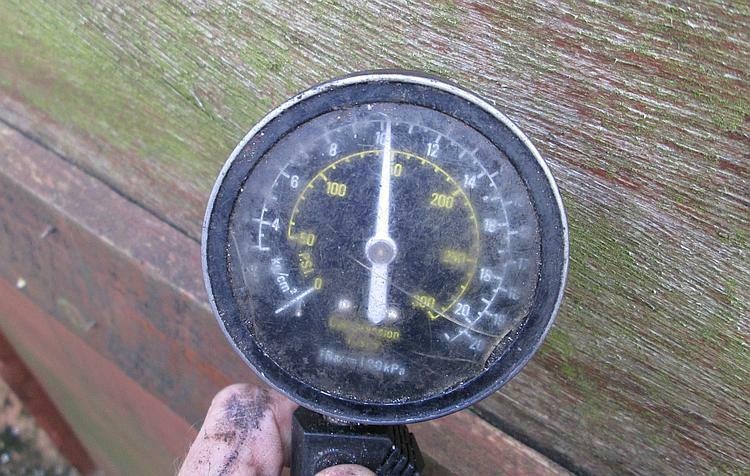 I've seen 125s - admittedly 2 strokes - down to about a hundred PSI (Lowest I saw was about 95PSI IIRC). A bit awkward to start, but still powerful and smokey (to me and my teenage mates) at the time. I would invest in a new gauge maybe it's giving a false reading. Did they do psi in 1755. The bit of chain is in my shed Pete. It'll be used for something sometime. Even if it's just stripped for an article. Daf - yeah I thought 145psi would be more than enough. I ain't gonna worry about it. As for 2 strokes, nasty orrible things. Don't worry I'm going to order a new gauge. I can't stand it that my main mechanic hasn't got the right tools. I don't really know what it does but it sounds very impressive. Ha! My old scratched and worn out compression tester is more than accurate enough for my purposes. A compression tester is a pressure gauge, nothing more. At the end of the pressure gauge is some means of fixing the gauge into where the spark plug would be. The engine is turned over on the starter motor but it won't start without the spark plug. As the piston shoots up the barrel it squashes air/fuel and the gauge measures to what pressure the air/fuel is squashed. If the the air/fuel is not squashed enough it becomes hard to ignite when the spark plug is in the engine. The lack of pressure indicates a leak. It could be as simple as an incorrectly adjusted valve but in the case of my 125 it's a sign the piston and the rings that seal the piston to the cylinder are worn, becoming slack and letting air/fuel pass by them. Not bad compression for the miles. I'm wary of refreshing the top end of an old engine - I put new rings in a GN400 years ago and it smashed the tired old big end to pieces in under 1000 miles! HA! So what you're saying Bob is if I were to fix it all up the additional power and compression might just tip the presumably equally tired crank over the edge. I'll take that as a good excuse, thanks. There's a sadistic part of me that wants to know how long it will last without major surgery. Of course this could mean that when it does fail it could be catastrophic but I daresay I've had my value for money out of the bike. I'm currently on 68,200 miles. Yes, I was told some time ago (after the GN400 incident) that you need to rebuild all of a single cylinder engine, not just one bit of it. I think it applies much more to big singles but the principle is true I think. What RPM / Speed do you cruise the motoways on the 125? I'm loving my KLX250, I did my trip greenlaning in Wales and covered 810 miles in 3 days. I sit the KLX at 60-65MPH which is about 6500RPM, that feels nice and relaxed and is just below the power kicking in in 6th so I've got some left for overtakes. I'm really glad the KLX250 is meeting your needs Bob. Think of the money you'll be saving on fuel, think of the little fluffy twitty birds you'll not be poisoning quite so much. Think how much easier it is to handle in the mud. I tend to run the CBF125 at an indicated 54mph on the motorways. I estimate this will be around 50mph as I tend to run with the most strictly restricted trucks (most are limited to 56 which is 60 on my Speedo). I cannot tell you the revs though as mine is the first release which has no rev counter. I do give it squirts up to 60 and even 65 (indicated) if required, I won't keep it there. ...and that's the secret - most CBFs have their necks wrung mercilessly by spotty yooovs. I read somewhere years ago that no engine should be held at more than 66% for long periods and I've always stuck to that. The KLX redlines just under 11K so I figure anything up to and including 7K is fine and that works out about 65MPH GPS / 73MPH speedo. At that speed it's just coming into peak torque, feels nice and smooth and returns an easy 80MPG so it can't be far off right. Actully I tend to sit at 60MPH on the motorway, that's the speed I used to travel on my Vigor as it felt stressed above 60MPH. We've got an old 1600 Vitara with knobbly tyres and that likes 60MPH too - so I've just got used to traveling at that speed I guess. My XR125L feels very busy indeed over 50MPH, there's no revcounter so I've no idea what the RPM is at 50MPH but I suspect its "quite a bit", so I stick to 50MPH with an occasional squirt to 55MPH as required for the odd slow wagon. Yeah I reckon 66% is a sensible "sustained maximum". Of course it is both thrilling for the rider and perhaps even good for the engine to be given a sound thrashing on the odd occasion but only when it's safe to do so of course, your honour. Mind you I can thrash the motor on the 125 to the absolute maximum down the motorways without fear of Her Majesty's Constabulary wishing to have a word. The engine sounding "busy" is relative I've found. If I for whatever reason hold the 125 at 60mph for some time then returning to 50mph makes the engine suddenly seem all calm and peaceful. If I've been riding the 500 at 50mph then return to the 125 at 50mph the motor sounds frenetic and stressed. There's a lot of psychology at play here too. I must say the 125 is starting to sound quite rattly on startup these days.